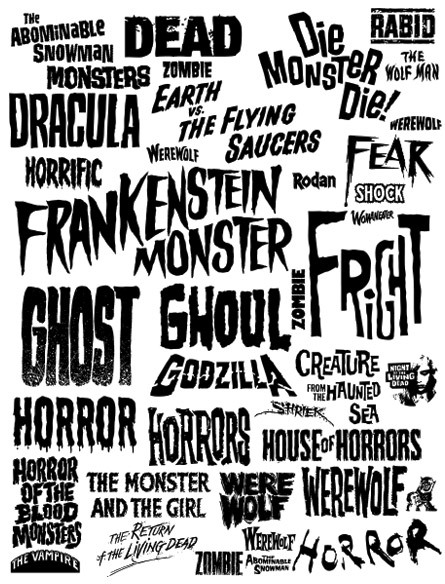 Thus, behold a collection of horror-themed words/logos that you can use for any of your design work and/or tattoo flash. I created this some years ago, scanning the art and converting to the EPS (encapsulated postscript) format and, for those who don’t do art-tech speak, a PDF (portable document format). If you have any graphics app, you can open these files and go straight to crazy town. If you do anything cool with this stuff, send me a pic or screenshot. I promise not to tell your mom/primary caregiver. Anyway, download HERE (EPS) and HERE (PDF). And may the Gods of Halloween not put razors in your nutritious trick-or-treat candy. This entry was posted on October 16, 2018 at 7:26 pm and is filed under Classic Horror, Misc. Horror with tags candy, Christians, Classic Horror, clip-art, EPS, Halloween, LimeBike, Misc. Horror, PDF, tattoo flash, Trick or Treat, Wall Street, Wiccans, wizard. You can follow any responses to this entry through the RSS 2.0 feed. You can skip to the end and leave a response. Pinging is currently not allowed.